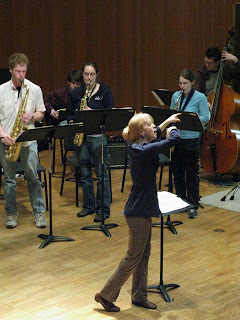 Maria Schneider in a free concert at Macalester? We had tickets for a play that night. Then I learned that Joan Griffith would allow us to attend the rehearsal on Tuesday. From start to finish, it was fascinating, a rare opportunity to see and hear Schneider as her band members do. Lit from above, she was luminous, lithe, and light on her feet. 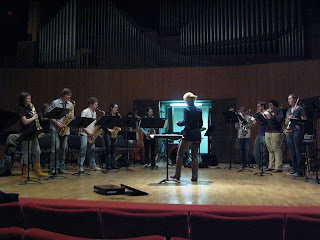 The band rehearsed three of her pieces: "Lately," "Choro Dancado," "Dance You Monster to My Soft Song." A fourth Schneider composition, "Tork's Cafe," was also on the concert program but wasn't part of the rehearsal. Schneider spent most of the time dancing across the stage, singing the phrases and rhythms she wanted to hear (wamp oo dah doo dee dah), gesturing, applauding, exhorting, instructing: "Paint a picture." "Deep breath." "Think Doppler effect." "Lay back." "More air." "Don't breathe in the four-bar space. Breathe somewhere in between." 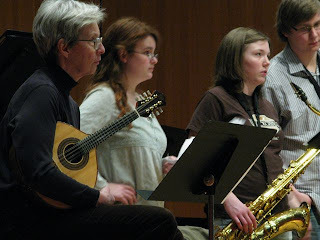 She encouraged MacJazz, the Macalester student jazz band led by Joan Griffith, with anecdotes about her own band: "They experiment all the time, so don't be afraid to try new things." And she told them how to learn to swing: "Listen to the Mel Lewis band, the Basie band.... Get it in your ear and start playing that way. Those guys didn't learn to play by talking about it." At the end, everyone sat on the floor around a boombox Griffith found somewhere and brought in, listening to "Lately" from Schneider's recording Days of Wine and Roses: Live at the Jazz Standard (2005). Thanks to Joan Griffith for letting us in. Photos: Maria Schneider; Joan Griffith on mandolin with some of her students; Maria Schneider with the band. Top photo by John Whiting.